The Russian victory over the French army in 1812 marked a huge blow to Napoleon’s ambitions of European dominance. This war was the reason the other coalition allies triumphed once and for all over Napoleon. His army was shattered and morale was low, both for French troops still in Russia, fighting battles just before the campaign ended and for the troops on other fronts. Out of an original force of 615,000, only 110,000 frost-bitten and half starved survivors stumbled back into France. The Russian campaign was the decisive turning-point of the Napoleonic Wars that ultimately led to Napoleon’s defeat and exile on the island of Elba. For Russia the term Patriotic War (an English rendition of the Russian Отечественная война) formed a symbol for a strengthened national identity that would have great effect on Russian patriotism in the 19th century. The indirect result of the patriotic movement of Russians was a strong desire for the modernization of the country that would result in a series of revolutions, starting with the Decembrist revolt and ending with the February Revolution of 1917. Napoleon was not completely defeated by the disaster in Russia. The following year he raised an army of around 400,000 French troops supported by a quarter of a million French allied troops to contest control of Germany in an even larger campaign. Despite being outnumbered, he won a large victory at the Battle of Dresden. It was not until the decisive Battle of Nations (October 16–19, 1813) that he was finally defeated and afterwards no longer had the troops to stop the Coalition’s invasion of France. Napoleon did still manage to inflict heavy losses and a series of minor military victories on the far larger Allied armies as they drove towards Paris, though they captured the city and forced him to abdicate in 1814. The Russian campaign had revealed that Napoleon was not invincible, putting an end to his reputation as an undefeated military genius. Napoleon had made many terrible errors in this campaign. One of the worst was that he refused to quit his campaign in Spain while trying to campaign in Russia. In trying to have both he gave up any chance at either. Napoleon had foreseen what it would mean, so he fled back to France quickly before word of the disaster became widespread, allowing him to start raising another army. Metternich began to take the actions that would take Austria out of the war with a secret truce. Sensing this and urged on by Prussian nationalists and Russian commanders, German nationalists revolted in the Confederation of the Rhine and Prussia. The decisive German campaign likely could not have occurred without the message the defeat in Russia sent to the rest of Europe. August 4–6: Battle of Smolensk. September 7, 1812: Battle of Borodino. September 14: Napoleon arrives in Moscow to find the city abandoned and set alight by the inhabitants; retreating in the midst of a frigid winter, the army suffers great losses. October 19: Beginning of the Great Retreat. October 24: Battle of Maloyaroslavets. 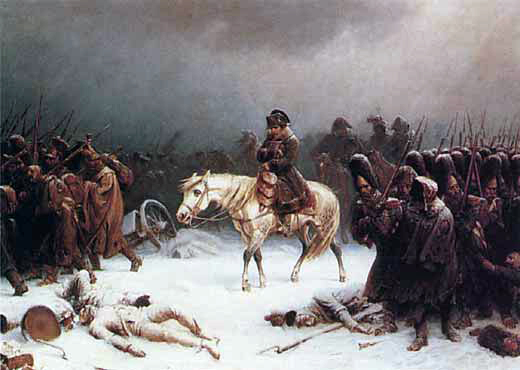 December 1812 – last French troops are expelled from Russia. November: Crossing of the River Berezina. December: Grande Armée expelled from Russia. What happened to Napoleon after his attempt to invade Russia? Who wrote this Id like to quote it in an essay? Very good synopsis. It should be stressed that much of Napoleon`s army was German or Italian and that the vast majority of the casualties were due to starvation and disease, not to enemy action. It should also be mentioned that the loss of strength in the early part of the advance was due to these causes. The Saxons and Austrians in the south suffered far fewer losses due to starvation than Napoleon`s main body, as did the X Corps up at Riga.